Elena was ordained as a small child in Cuba. She is from Susana Cantero, Omi Toke’s lineage. Interestingly, Elena’s outfit was a dress and not the typical jacket and “bombacho” pants we are used to seeing today. The reasons for this are not clear. In the close-up photo of the outfit, notice the beautiful simplicity which is in stark opposition to the more elaborate outfits currently made in the United States. The use of garments, in almost all contexts ceremonial, varies according to the type of ritual performed. On the second day of an olorisha’s ordination, known as el da del medio, usually loosely translated into English as the middle day, the newly ordained iyawo (lit. wife of the gods; a novice) wears two outfits that are especially commissioned for the ritual. 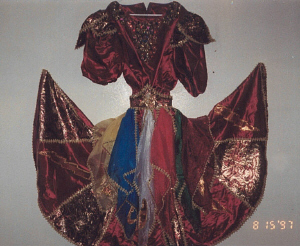 These garments are made in the specific colors of the person’s tutelary or principal orisha: red for Shango, blue for Yemoja, white for Obatala, and so on. 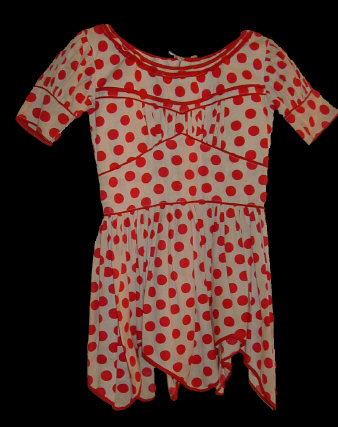 The first of the two outfits, called traje del almuerzo(lunch outfit), is usually made of gingham. It consists of a calf-length dress for women and a shirt for men, usually riveted with white serpentine. For the most part, lunch outfits for the so-called warrior orishas (Elegba, Ogun, and Oshosi) are made of burlap, ornamented with serpentine in their ritual color. These outfits typically consist of a shirt and pants regardless of the iyawo’s gender. 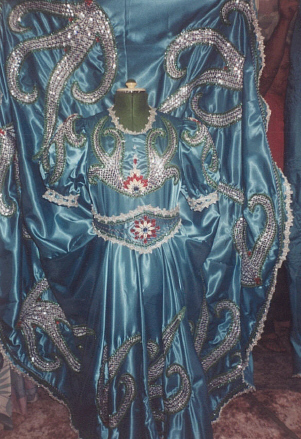 The second outfit used by the iyawo is called traje de gala-the coronation outfit-for it is while wearing this outfit that the iyawo is “crowned.” This outfit is much more elaborate and complex than the almuerzo outfits and is the most telling exhibition of the artist’s dexterity and creativity. This art form has evolved tremendously in the United States over the past twenty years. This is immediately apparent when you compare Elena Alfonso’s ordination outfit to Eusebio Escobar’s or Nayla Llanes’ more contemporary work. The outfit used for the female orishas is usually a midsleeve, calf-length dress, in a style reminiscent of nineteenth-century Cuban colonial era, with a waist band that is tied in the back. 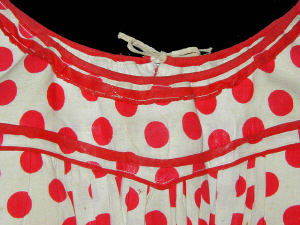 Often kerchiefs of the same material as the dress hang from the waist band. 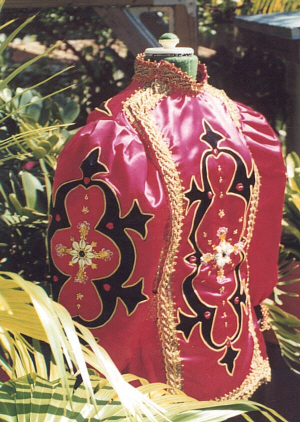 Garments for the male orishas typically consist of a high-necked, long-sleeved jacket with a belt or strap tied around the waist. Often bombachos, baggy trousers that are sustained by elastic at the knees, similar to the knickerbocker pants of days gone by, accompany the male’s outfit. Still, a normal pair of white trousers may also be used. Many of the male orishas’ garments also have bantes clinging from the waistband that are made of the same material as the outfit. These sword-shaped bands of cloth, originally of a phallic nature, accentuate the orisha’s masculinity. When a man is ordained to a female orisha, the outfit consists of a jacket and pants in the appropriate color of the orisha, but a woman who is ordained to a male orisha will wear a masculine outfit regardless. In the case of the latter, the lunch outfit is a dress, though, except only when the ordination is to the warrior deities, then it will follow the burlap shirt-and-pants tradition. Some oloshas argue that male orishas do not recognize their daughters as female but rather as males. When dressed in the traje de gala, the iyawo also wears an elegant and embellished textile crown, normally made from the same materials as the coronation outfit. The ordination of a Lukumi olorisha is considered analogous to the coronation of a king or queen. Once the iyawo has been dressed in the coronation outfit, the ordaining olorisha will ceremoniously place the crown on his or her head, symbolic of the newly acquired status. The ornaments on the crown vary according to the iyawo’s tutelary orisha. Typically, crowns for the female orishas are adorned with rhinestones, whereas those for the male orishas also may have cowries. Additionally, all the crowns except Shango’s are adorned with the red tail feathers of the African Grey parrot in the ritual number related to the particular orisha (e.g. 7 for Yemoja, 5 for Oshun, 8 for Obatala and so on). These feathers are highly valued by the Lukumi/Yoruba and their New World descendants. The warrior orishas do not wear crowns. Elegba and Ogun typically wear a hat ornamented with cowries and rooster and parrot feathers. Oshosi uses a Robin Hood type cap, also ornamented with cowries and feathers. A second option for all three is a band of goatskin, ornamented with beads and cowries. In the majority of the lineages, the crown is worn only at the ordination ceremony and when the olorisha passes away. Still, some lineages do use the crown for the ritual of presentation of the iyawo before the bata drums. For the most part, these garments follow the same pattern as the traje de gala. They are specially made for the individual specifically engaged as a mount (i.e., to be possessed by the honored orisha) at a wemilere. These outfits do not require a crown. Instead, the mount will typically wear either a kerchief (for a woman) or a textile cap (for a man) ornamented in the same fashion as the outfit. Olorishas tend to cover their heads for most of their ritual activities. This serves two purposes. Primarily, head coverings are seen as a means of protecting the olorisha from negative energies that are being withdrawn from a person afflicted by them in cleansing rituals. In this case, they protect the head (considered a receptor and entry point of energy into the body) and, by extension, the olorisha from harm. The second purpose is one of identification and embellishment. Many head coverings reflect a level of devotion and commitment on behalf of the olorisha who takes pride in wearing something that reflects his or her orisha’s colors or attributes. 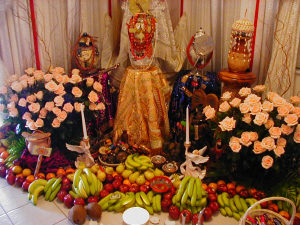 Panels are used by Olorishas to dress their Orishas attributes on special occasion such as religious anniversaries or other festive celebrations. Often olorishas may keep these panels on their deities for indefinite periods and change them yearly. Panels vary according to the olorisha’s financial resources. They can be as simple as a piece of metallic brocade or a piece of satin, riveted with lace, sequins, or other metallic trimmings. The so-called mantones de manila, embroidered silk shawls imported from Spain, have been very popular with some olorishas since at least the Republican era in Cuba. In the past, many olorishas also embroidered their own panels and orisha garments by hand. The most elaborate of the panels are unique to Lukumi religion and may have originated (and lately evolved a great deal) as an orisha art form in Miami in the 1980s. Generally, they are specially made and richly decorated, with the artist making use of a multiplicity of aesthetic elements to bring out the nature and predilections of the orisha for whom the panel is intended. Rhinestones, beads, cowries, pearl, different types of cloth, and various sorts of metallic trimmings have become the preference. Playing on orisha-related themes and motifs, using textiles of the colors associated with the orishas, their attributes, and elements related to their earthly domains, their relationship with nature, their totemic animals, their emblems, all or some of which may be selectively depicted on the panels, artists mark their work as an exclusive creation for the Olorisha who commissioned it. The panel is to be used solely by the orisha for whom it was made. Shango’s panel cannot be used for Yemoja, and neither can Oshun’s be used for Obatala. Each panel is unique, like the orisha for whom it is intended. Panels can also be used at wemileres to dress the orishas who possess their priests or priestesses. Typically, the female orishas wear one over their shoulders as a type of shawl. Oshun takes pride in dancing with her ala (shawl) and uses it to entice and lure Shango and Ogun by throwing it over them and pulling them toward her. The male orishas tend to wear the panel tied to their waist. When mantones are used by an orisha in possession, the female deities tend to place the manton (and often the panels as well) over their shoulders and then open it as if it were a large caul, often taking a devotee under it, symbolically sheltering the person from evil. Frequently the orishas use the panels to pass over the bodies of the attendees at a wemilere to cleanse them of any negative energies. At times, the orishas may also choose to give these panels as presents to a special devotee present at the ritual. Olorishas will also use textile panels to dress, or adorn, the jars containing the ritual implements and attributes of the orisha. The use of these will vary in context and meaning, according to the specific situation. For the most part, their function is ornamental, meant to please the orisha and exhibit him or her in an attractive fashion. At other times, the use of panels or textiles on an orisha may be ritualistic in nature, especially if recommended by the oracles to cover a deity with a specific piece of cloth. In some of these cases, an olorisha may use the panel of one deity for another, but it must be determined in divination and not by whim. The color of cloth that is used is often revealing: white, the “coolest” color, is meant to soothe or calm an irate orisha, upset with a devotee for an offense; red, a “hot” color, is often used to energize and revitalize, as well as to reject negative energy. Yellow saddens Oshun, reminding her of the most difficult period in her life when she was so poor that she owned a single dress, a white one, that turned yellow and ragged from washing it at the river’s edge. Oya is often covered with multicolored cloths that stress her close ties with the Egun (ancestors) and other spirits. When used in thrones, panels represent the orisha for whom they are made. In this context, they are considered the orisha’s flag and are hung only on thrones intended for the ordination of an olorisha. Typically, four panels are used, and their place in the throne is ritually dictated. The panel representing the orisha for whom the throne was built is placed at the center. In the front, clinging to the ceiling, is hung the panel representing the orisha of the ordaining priest or priestess. On either side of the throne are the remaining panels. In the past, pillows were also used for the throne.